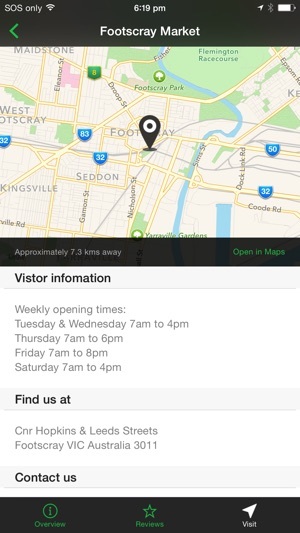 Award Winner - Victorian Government "App My State" Competition. 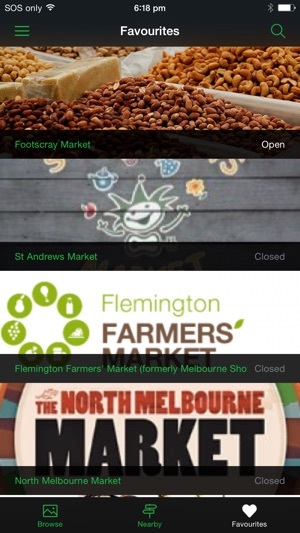 myMarkets Vic provides easy access to information about markets all around Victoria. 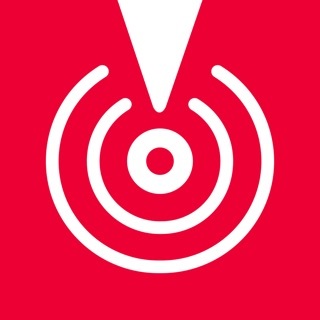 The app is light and informative, designed to allow users to engage in market communities, and enable them to share their personal experiences. 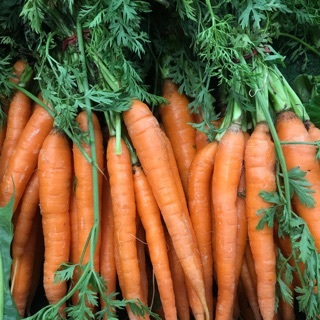 Whatever your experience of the markets, whether you’re a local shopping for your weekly groceries, or trekking across the state (or the world) to experience another community, you’re sure to have information and experiences that you could share to enrich others, or maybe you would love to explore what other market goers have shared with you. 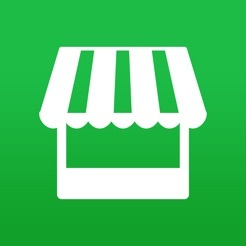 1) A Social Tool - the app allows you to communicate quickly and efficiently with other market goers, facilitating the free exchange of information and experiences; maybe submitting a photo or two, checking out the number one rated market for the week, or commenting about a great experience you’ve just had with a stall holder. 2) An Informational Tool - providing market information, opening times, contact details, location, map information and more. 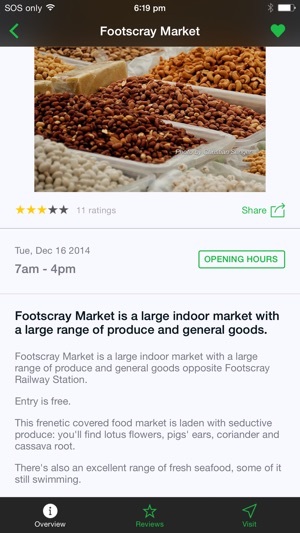 The myMarkets Vic app has a friendly, clear user interface, with everything accessible in just a few clicks. Innovative and ground breaking, the app provides real-time feedback with powerful market rankings driven by user ratings, showing the market goer what’s hot and what’s not so hot. 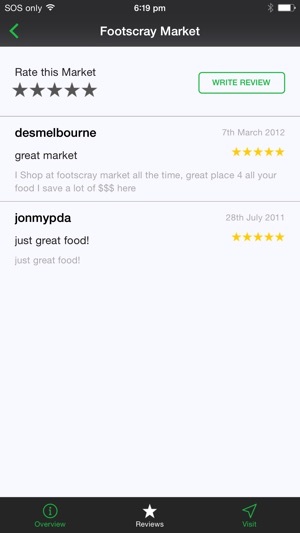 With geo-location tools, social feedback and a user rating system myMarkets Vic explores another dimension of the use of our (Victorian) data and broadens the way we view our world. Minor fixes to data syncing with backend database. Doesn’t even open. Keeps crashing. I was really excited to see the app as I use the website regularly but I’m having issues with that recently. 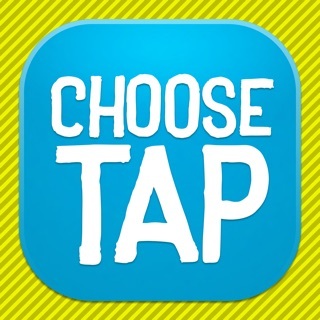 I downloaded this app but it doesn’t even open. It keeps crashing as soon as I open it. I deleted it and tried downloaded it again. Same thing. Please fix these issues on the app and the website! I love this app! But now it will not open for me!!? It just flashes and then goes back to the home screen like I have not even touched it to open!! Help! I've never had any crash problems... that aside, I think this is a wonderfully useful app. 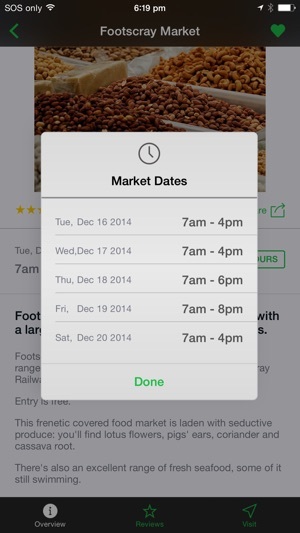 I've recently taking up collecting, so this app is useful to look up opening times of the markets I frequent. I do have some issues though. I've tried reviewing/commenting on markets, but you can barely say anything about them with a mere 140 words - we should be able to post longer reviews. Another is that there are different types of markets : organic produce, trash and treasure, crafts, etc. There should be a category system or a list of things for sale.